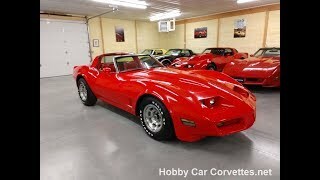 Hi, I am interested in your 1980 Chevrolet Corvette listed on Autotrader for $11,000. I'd like to get more information about this vehicle and confirm its availability. Numbers matching, L48/350 motor, automatic transmission, 96,000 miles on dash, red interior, alloy wheels, power steering, power brakes, power windows, AM/FM/Cassette player, sport mirrors, tilt & tele steering column, and much more. We replaced the 4 brake calipers, 4 sets of brake pads, 4 brake hoses, master cylinder, steering coupler, spark plugs, spark plug wires, rebuilt carburetor, and much more. We also changed the oil and filter, transmission fluid and filter, rear end grease and additive, and checked and lubed the chassis.